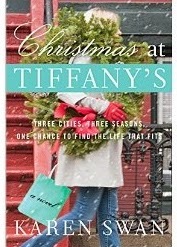 Christmas at Tiffany's is a novel of friendship, exploration and love. It's also the story of how one woman's search for herself impacts others closest to her and, in some cases, forces them to question their life choices as well. Multifaceted and engaging, the novel begins with Cassie Fraser's heartache at discovering, at her tenth wedding anniversary, her husband's duplicity. Turning to her boarding school friends for an escape route, Kelly, Anouk and Suzy each decide to help Cassie rebuild her life from the ground up, in their three different cities, in their three totally different ways. Cassie spends time in New York, Paris and London and in each city, she finds a little more of herself. New York gives her the confidence to handle a new job (although with interesting results) and a new boyfriend. She makes new friends and experiences life in the fast lane. In Paris, Cassie befriends Claude, a Michelin rated chef with demons of his own. In Cassie, Claude finds someone to mentor, and Cassie believes she has found her new path in life until tragedy and then betrayal strike, and she's forced to re-evaluate what is really important to her. In London, and later at Suzy's family's country estate, she's finally forced to make a decision about her marriage. In each of Cassie's stops along her year-long tour of self-discovery, Suzy's explorer brother, Henry, leaves a list of must-sees and small gifts for Cassie. At times, he personally acts as her tour guide. And while she's amused and at the same time, confused by these gestures, she follows along in order to humor him, all the while missing out on the message he was really trying to deliver. Karen Swan writes with clarity and purpose. Her prose is straight-forward and tells the story so well, you feel you know every one of the characters. While Cassie is the catalyst and the main protagonist, each of the characters is really front and center along with her. The reader gets to know all of them very well, and their stories become just as important as Cassie's. Juggling so many balls in the air at once is an amazing accomplishment. And in this book, Ms. Swan lets none of them hit the floor.